My Mama calls this peasant food. When I think of peasant food, dry, old cabbages and stale bread spring to mind, but I guess in France even the peasants are more gastronomic than the average bear. Either way, this hearty soup is so damn delicious you’ll embrace your inner French peasant. Oui, oui! I was inspired to make this yesterday for two reasons – the first was it was cold and wintery, the second, I found a delicious loaf of green olive and rosemary bread at the Bourke Street Bakery and needed an excuse to eat large amounts of it. The match was made in heaven. You don’t need fancy bread to complete this, but something fresh and crusty certainly makes a difference. Also, a big, fat bucket of wine would have been a lovely accompaniment. Soon, my sweet, soon. I favour prawns, white fish and squid in this, but the standard seafood mix from Woolies is fine. My only advice with that is that you separate the components as they have different cooking times and we hate rubbery squid and bouncy prawns. Perhaps I had a recipe for this once, or perhaps it was just word of mouth from my Ma- but as I do, I’ve bastardised over the years and I make it differently each time. This is how I made it yesterday, and it was really yummy. Into a large soup pot throw your stock, tinned tomatoes, and add one tin of water and put onto medium heat. Add your garlic, and onion, and fennel and tomato paste. When you bring that to the boil, turn it down to a simmer and add your julienned vegetables and your potato. Leave this to bubble away until your potato is cooked. Add your fish first, then a minute later, add your prawns, then a minute later add your squid, mussels or scallops. Grate in your lemon zest and throw in your parsley and you are pretty well ready to go. 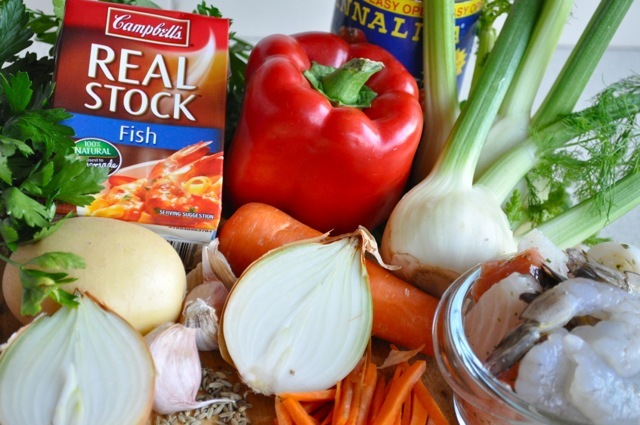 Season to taste but remember that fish stock is quite salty already so don’t over do it. I wonder what the rich people are eating? Super healthy and delicious, thanks. Pleased you like it! 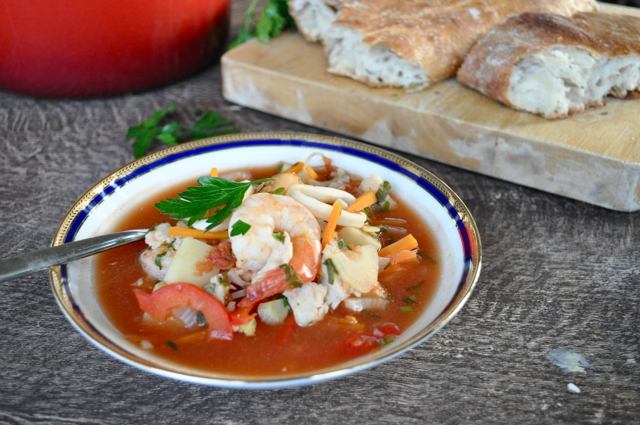 You have so much great seafood over there in Spain, you’ll love this soup!